Spring is here, the birds are singing, Nature is blooming. It’s time to unplug, get outdoors, connect with Nature and feel fully alive! Since ancient times ceremonies and celebrations have been held to honor this glorious season. Rituals would include Salutations to the Sun; Honoring the Earth; Fertility rites such as burying colored eggs to encourage crops to grow and for all to prosper (Easter egg hunt anyone? ); Wrapping trees with ribbons; dancing and singing etc. These ancient cultures were deeply connected to the Nature that surrounded them and took time to celebrate, honor and show their respect. Spring is the perfect time for you to get Rooted and re-connect with Nature and its tremendous health benefits. Much research has emerged about Nature’s restorative power and its profound effect on our physical, psychological and spiritual wellbeing. In our daily lives, wired to technology, we become disconnected from our body, our spirit and our true self. Our true nature is to be connected to the planet with the cycles of the seasons; our feet are designed to walk on the earth, on grass or sand – not concrete; our lungs ache to breathe fresh air in the woods or by the sea – not fumes and air conditioning. Our modern world separates and eventually isolates us from Nature and our true selves. You owe it to yourself to re-connect with YOU this Spring! 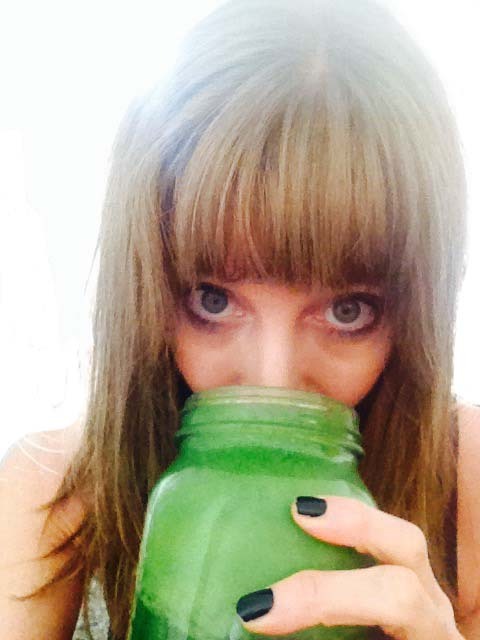 I love this fresh, clean, green drink for a bit of “Spring cleaning”. I make a jar on Friday night and freeze it to take on my Saturday hike (don’t forget water too!). Or you can do a “mini juice cleanse” as part of your personal weekend retreat : 2-4 juices per day and one light healthy meal per day starting on Friday night. This juice combines the cleansing benefits of lemons with the superfood cilantro! Cilantro is packed with nutrients for the body, hair, skin, eyes and bones: essential oils, antioxidants, potassium, magnesium, calcium, iron and Vitamin A & K. Vit. K promotes osteotrophic activity in the bones which helps build bone mass! 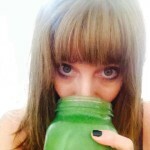 Here’s my Spring Clean & Green Recipe – Juice, Drink and Glow! for Vitamix add 1/2-1 cup of water and 4 ice cubes.